October contents: Time to Plan your plot for Next Year - Planning Pays Off......Time to Take Stock......Keep a Weather Eye out Now!.....It Could Soon be Time for a Major Cover Up!.....Worms are My Co-workers.....To Bean or Not to Bean? - That is The Question!....Autumn Pests......There's a Permanent Hen Party in my Garden!....A Personal Harvest Festival and 'Thank You' to all of you! Time to Plan your Plot for Next Year - Planning Pays Off in Abundance! It's almost the start of another gardening year already! Next month all the seed catalogues will have arrived - some have already - and I never fail to find that exciting! What new excitements will they bring this year? While you can still remember - make a few notes now of what you want to grow less of, what you would like more of - or what you found difficult or expensive to buy that you didn't grow yourself but wished you had this year! Make a cropping plan for next year while you can still remember where everything was this year! This is much easier to do on graph paper - so that when the catalogues come - you will have a very good idea of exactly what you want to grow next year, where you're going to grow it and roughly how much seed you will need. That will help to stop you being tempted to buy too much - in theory - (Rarely works for me!) Most catalogues calculate packets of things like peas and beans, for instance, for sowing a 15 ft or 4.5 m row. I find that sowing most seed into modules, rather than sowing direct in the ground, saves hugely on expensive seed. It's no more trouble and you use far less - and also lose far less seedlings, if any, to those slimy night-time visitors - or all the other disasters that can happen to seeds, like rotting in a cold wet soil! Working out exactly how much of anything you want to grow, knowing how many modules you need for a row or block of something - with a few to spare just in case - and approximately how long the crop will occupy the space is very useful. It allows you to calculate amounts, helps you to make the most efficient use of space, and consequently to get the best value out of your plot for the work you put in. With good planning and module sowing, even a very small plot can produce a surprising amount of good things to eat all year round, by overlapping crops and also inter-planting in succession as I've always done, surrounded by flowers and fruit, and keeping the plot full. That's how nature does it. Whatever - it's all about getting the very most out of your space - and also for me the aim always also been to save as much money as possible on the household budget! The more you can grow yourself - the more you will save - and these days that's a big consideration! After the long summer drought we've just had - many vegetables may be more expensive, scarce or even non-existent! So even if you only grow your own fresh salads - this could easily save you €25 a week without any problem - and they would be far fresher, and far more nutritious and not washed and bagged! Add that up over a year and you could actually have the price of a small polytunnel or greenhouse! There's also nothing like the good feeling that comes from being even to a small extent self-sufficient and not having to buy expensive, travel-weary organic vegetables from the shops - that's if they're available. It's so much healthier and far more satisfying to have your own really fresh, organically grown produce! Making a good cropping plan also helps you to avoid growing things in the same place too often, which can attract pests and diseases. If you the plan well, you'll only have to do it once - you won't have to scratch your head and do it every year!. Divide your plot into four and after that you just move everything round one space every year - and that's a four course rotation, or divide it into six and then the same crop only hits the same space once every six years and so on. Planning a proper rotation and growing as wide a range of crops in soil as possible is the best way to improve it. Planning always pays off. I know we haven't even got this gardening year over with yet - but believe me your success next year starts now - with good planning and forethought! When we first came here in 1982 - 36 years ago now - I'd already had the (rather painful) benefit of having been bed and then chair bound for several months after a back injury and then subsequent viral meningitis, possibly transmitted by a visitor - probably due to my immune system being low after all the pain-killing and anti-inflammatory drugs I was prescribed at the time - which I have never taken since then - preferring natural methods. Luckily no other member of the family caught it but I discovered later that a woman living in the same road sadly died of it - so I was extremely lucky. Anyway I kept myself amused by planning the whole garden and orchard in minute detail on huge sheets of graph paper while I could do little else, and reading everything I could get my hands on. I was so determined that I would get better and be able to garden and grow all our own organic food again. Those hours spent dreaming, reading and planning were some of the best spent hours ever - they've been paying off in time saved ever since! The apple and cherry trees i planned have grown huge. 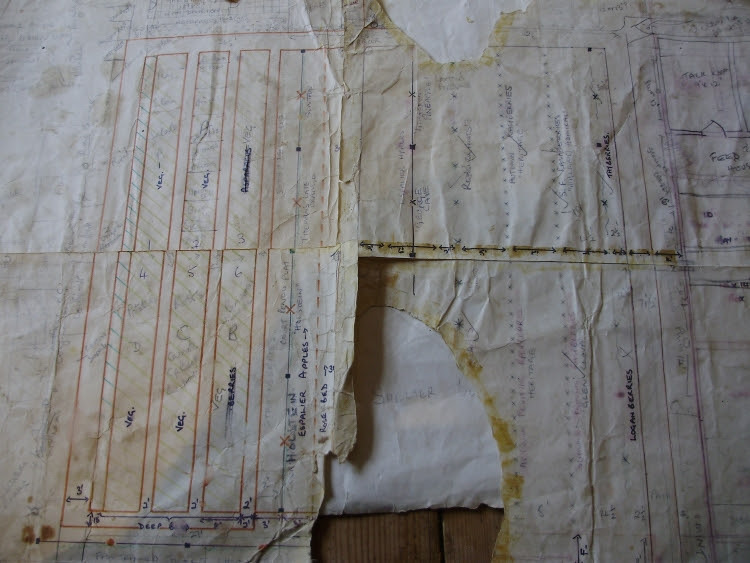 You can only just about make out the writing on the very battered and scruffy old plans pictured above. They were often taken out into the garden with very hopeful and often very muddy hands - and even occasionally chewed by some puppy or other! There are a few bits missing - but these old plans that encapsulate so many hopes and memories are so precious! To the bottom left of the plan, you can just make out the words 'Deep Beds'. These were my first raised, 'no-dig' or 'deep' beds similar to those I'd seen the late Geoff Hamilton making on Gardener's World. They were made initially by throwing up all the soil onto the beds from the paths. This immediately gave me higher raised beds which needed far less bending - something I knew I would probably never be able to do comfortably again. They were also better drained and warmed up more quickly in spring. Making lots of compost and using green manures gradually improved the degraded and abused soil we'd inherited and brought it back to life. The six beds later became twelve, when I began growing commercially a couple of years on......... and the rest - as they say - is history! It was lovely to come across those old plans a couple of years ago - they bring back so many memories. Many of the old gardener's 'Kalendars' of a couple of centuries ago made October the last month of their gardener's year. In a way I tend to agree with them. I always feel that when the most frost tender crops are safely gathered in and stored or preserved then the work winds down just a little. It's not so frantic trying to keep ahead of the weeds and the slugs - and everything is starting to grow quite a bit slower. This month is a really good time to take stock of the past year while we can still remember clearly any problems, any failures but hopefully too - the many successes. Even if you've had a few disasters (believe me we all have them) - there's always something new to learn from them, and maybe something else to feel good about. Perhaps it's a new variety that you've tried that was successful for you when you'd had none before - or a new vegetable you've grown for the very first time that you really love the taste of - like the lovely new Scarlette Chinese cabbage. Hopefully too - you have a freezer or larder filled to bursting with lots of stored goodies to see you through the autumn and winter! A gardener's work is never done - as all the books say. But take some time too, to enjoy and really savour the results of your labours. Give yourself a pat on the back for working so hard all summer - while you enjoy the beautiful, tasty and satisfying results of your labours - you've earned it! Keep a Weather Eye out Now! We've had several frosts over the last few weeks - earlier than usual here, so I hurriedly planted out the very last of the hardy salads last week that were sown in modules last month, before the soil gets really sticky and cold. My soil is heavy clay - sticky when wet - so growing all my veg in raised beds is ideal. I've been doing that ever since I first came here, because they're not just easier to reach when working - they're also far better drained and warmer than the soaking wet lower ground surrounding them! They're easier to cover with fleece or cloches too. We often get one hard frost in the middle of October and then often no more serious ones until after December (I won't say the C word!). Unless your ground is prone to flooding or water-logging - things like parsnips, Jerusalem artichokes, celeriac and leeks can stay in the ground quite happily and be used as you need them - I think they taste much better that way. I never start eating my parsnips until after the first frosts. Parsnips take a long time to grow and they need a good frost to develop their sweet flavour properly. I do hope that global warming won't mean warmer far wetter winters and tasteless parsnips! The Oriental veg outside will have appreciated the rain for the last two days even if we didn't. They were needing a good downpour in the raised potager beds. The Chinese cabbage are hearting up nicely, the Oriental radish Pink Dragon and Pak Choi Rubi are growing as satisfyingly fast as they always do - and I think we may even chance a stir-fry by the weekend, along with 'courgetti' noodles from the last of the gorgeous yellow Atena courgettes! It Could Soon be Time for a Major Cover Up! With weather so unpredictable in October it's best to be prepared - so I'm also checking over my fleece collection now. I will have to cut a few new ones as I generally stuff them into old compost bags over the summer when they're not needed - but the mice found some of them this year - they must have made a lovely soft nest - but now are totally wrecked! As usual the mice of course are thriving! I won't throw them away though - they'll still do for a top layer when the weather gets really cold and I may perhaps need two or three layers (I don't fancy 'mousey' fleece sitting on top of my salads!) - I'll just put the new clean ones on top of the lettuce or anything else that won't be cooked! I bought a huge roll of fleece from my local farm supply shop a few years ago and I cut off new bits as I need them. I have a system that works very well now, of wire cloche hoops covered with netting secured with wooden clothes pegs. Netting always has to be over anything green here or it would all be eaten by pigeons or pheasants! Then on cold nights I put fleece over that too - resting on top of the net - using the clothes pegs to secure it all, as you can see from the picture on the left. The plastic netting nicely stops any heavy dew or rain weighing the fleece down onto the crops where it would often freeze solid on cold nights after heavy rain - offering no protection at all to crops! This works well for me. I'm also cleaning my plastic cloches at the moment, to remove any dirt that might block the light - it's surprising just how much grime and dust they can collect. Talking of covering things - make sure that if you have bags of seed or potting compost outside they are securely covered with something waterproof. They should be covered all the time - even in the summer - it's absolutely criminal to waste good organic compost, by leaving it open to the weather so that it deteriorates! And I've said before - I now use a really good peat-free, organic compost. I can't recommend Klassman peat-free compost which I use highly enough - It's just fantastic! I've used many different composts over the years - but this is truly the best of any kind that I've ever found - and over the years I've tried them all! Plants absolutely love it - making terrific root systems - and since using it, I've actually never had fewer losses in my autumn-sown seedlings. It's worth every cent when you think of it in terms of plant losses saved! This is always a dodgy time of year for seedlings as growth is slowing. Plants are like us - their immune systems don't always function as well when the light fades and it gets colder. Peat-free is not always the cheapest compost - but it's definitely the best from every other possible perspective! If you're careful with it and use module trays rather than more wasteful seed trays, you don't need that much anyway. Covering up is best for your compost heap too! That should always be covered to prevent leaching of nutrients! As we have such wet winters here in Ireland - at this time of year, I like to spread a light dressing of good, well-rotted home-made compost on any empty beds that I will need for my earliest sowings next year - then I cover them with black polythene to keep out heavy rain and stop weed growth by excluding the light. Underneath the cosy cover the worms will go on working for most of the winter - pulling the compost down into the soil, making it even richer and leaving a beautifully clean, weed free 'tilth' on the surface of the beds which is absolute bliss to work lightly in late winter/early spring. I know a lot of people don't like using plastic - but mine is really heavy old recycled silage cover which I have been using for over 30 years now! It's surprising how long it will last if stored out of light when it's not in use - and using it has the benefits of causing far less pollution to ground water and loss of precious nutrients. 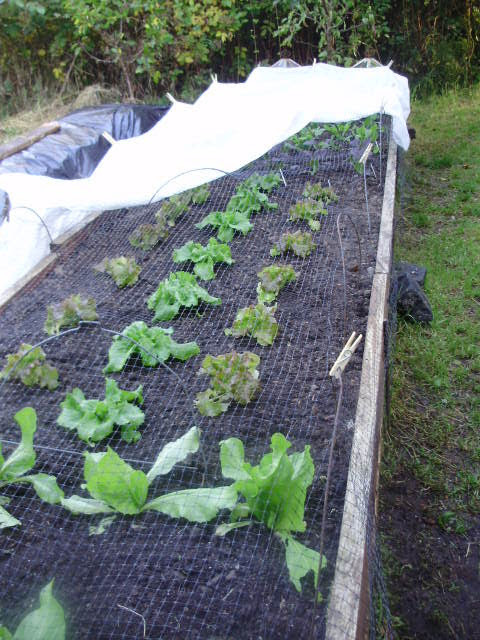 Old polytunnel covers are also useful for covering beds - mine never get thrown away when I'm re-covering a tunnel! I do 'minimum dig' or 'worm dig' here! That gives me the maximum return for minimum work! Let the worms do your work for you is my motto! Completely 'no dig' is not actually possible if you take it literally - I mean, you do actually have to plant things! 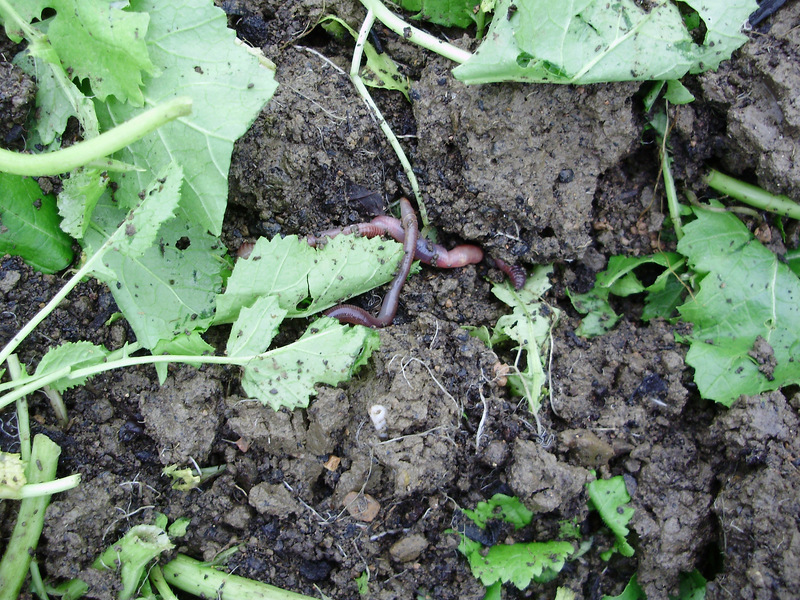 Worms won't just cultivate your soil for you - they will also enrich it with their nutritious worm casts - actually estimated to be at least 9 times higher in nutrients than what went into the worms! This encourages all the soil life and microorganisms that will make plant foods available to your crops next year. Those billions of micro-organisms are the soil's digestive system - so you want to encourage all those flora and fauna as much as you can - they are like 'probiotics' for plants - and you'll be amazed at the difference they make. In the picture here you can see worms already getting to work on green manure mustard after cutting down and lightly forking into surface. The thing about all the so called 'no dig' experiments I've seen - is that they were actually comparing double-digging with the 'no dig'. So of course the results of digging are bound to look like rubbish! What's happening in the 'dug' bit is that lifeless, microbe-free, sub-soil from two 'spits' down is being turned up to the top. Soil takes a long time to recover from this unnatural upheaval unless you're loading it with FYM or very good compost - so of course the results won't be comparable to soil just lightly forked over, fed with lovely compost and planted into! No wonder that 'No Dig' looks so good. Nature doesn't do no dig' - it's dirty little secret is that it employs an army of mini-diggers in birds, squirrels, rats, worms, beetles, fungi, you name it - that evolved to tunnel, burrow and scratch etc! I suppose you could say I use the 'wildlife mini-dig' method - scratching the soil over with a three prong cultivator if I need a loose surface. The worms do all the rest - with the help and encouragement of additional mulches. That way all the soil life stays in the same place - although it does need oxygen too - and aerating just it a little actually stimulates the microbes a bit. But even doing that breaks up the huge webs of fungal threads that develop under the soil - so it's all about achieving a natural balance, and imitating nature as much as possible. Even if I grow a green manure - I try to disturb the soil as little as possible, then I chop it down, scratch the surface and leave the worms to do most of the work, which Nature evolved them to do. To Bean or Not to Bean? - That is The Question! A lot of people sow their broad beans and early peas at the end of this month or in early November. Although I've put them in the sowing list for this month and they may work for some people, who live in drier areas with better drained soil, over the years, time and again I've proved that outside in my garden anyway, they are much better sown early in the year in pots and planted out after hardening off. Try a comparison yourself and see what you think. My soil is very heavy clay and their roots can often tend to rot in a very cold wet winter. We seem to get increasingly wetter winters now and I hate wasting time and seed. Those sown early next year always overtake and crop much better than any I've ever sown in the autumn. It's not worth risking expensive seed just to feel that something's happening out there! There's really nothing to gain and there are plenty of other positive things you can be doing instead. Sow green manures, or put some sort of cove, on any ground that won't be carrying a crop over the winter and which won't be needed too early next year. Don't forget that even these need to stick to your rotations. I find here that overwintered green manures don't work well on beds that will be needed for very early sowing or plantings as the weather is just too wet here in Ireland. The soil often doesn't dry out out enough to use until late March or early April - often even if it's covered early in the New Year. Most green manures need several weeks after covering to break down sufficiently and be pulled down into the soil by worms before you can successfully sow or plant into the beds. That can take quite a chunk out of the growing season. It works in the drier environment under cover in tunnels, but the growing space in there is so valuable, that most of it is covered with crops all year. So it's mulched and well fed with good compost to keep the worms happy and crops growing well - with occasional green manuring! Soil is like life - you only get out what you put in! If you've had any pest problems such as aphids this year then sow a few hardy annuals into modules or pots now - like limnanthes, alyssum and calendula - or other single-flowered hardy annuals. These will flower really early next year, bringing in early bees for pollination and also attract any early hover flies to start the all important pest patrol. If you've grown alyssum in the garden this year - dig it up and transplant it into your polytunnel or greenhouse - it will flower all winter under cover. Leave a patch of nettles somewhere too - for early ladybirds, whose larvae also voraciously eat early aphids, and also for butterflies to lay their eggs on later in spring. Start feeding garden birds now to attract them in - unless you've already been doing it all year like me - in which case they're in the garden already. Peanuts and fat balls are good (remember to take the nets off!) There's more info on encouraging helpful wildlife in those sections of the diary. Pests thrive in a garden full of juicy vegetables with no predators to bother them. With no food, flowers or habitat to attract both pollinating insects and other vital creatures which control pests - they have a field day! I'm always amazed that some gardeners seem averse to growing flowers among their vegetables - particularly some men - who seem to think that flowers are a big girly! I honestly hardly ever see pests. Flowers are absolutely key to attracting beneficial insects. They look lovely too! Interestingly - I've been saying this for many years here on the blog - and I am now beginning to see one or two other well-known male gardeners starting to grow flowers on their veg plots which is good. Keep on tidying up any dead and decaying leaves now too - to keep diseases down. Mould and rots can spread like wildfire in the damp, cold autumn weather. Make compost but don't - as I heard one garden expert recommending recently - put any blighted potatoes or tomato foliage into your compost heap! Unless that is it's an absolutely enormous heap that's almost hot enough to cook eggs on! The disease spores can survive anything less and will infect your crops even earlier next year. Put anything like that into your council green waste bin if you don't have a huge heap. And don't compost any bought onion peelings either - put those in the green waste bin too, just in case they could be carrying onion white rot. It's always far better to be safe than sorry! Keeping all weeds down on beds and keeping grass paths mown short is really important now - you don't want to give slugs and snails anywhere to hide from predators like birds, hedgehogs etc. over winter. Slugs and snails can breed and multiply at an alarming rate in wet autumn weather before the ground gets too cold. In the autumn of 2013 when I had just broken my shoulder in September, I couldn't manage to keep the weeds and grass down on some beds - and believe me I paid for it! Slugs were quite a problem in some of the outside beds the following year. Crane fly larvae or leather jackets were an even bigger problem. They love to lay their eggs in the lovely soft soil of raised beds if they have the shelter of a few grassy weeds. Then the following spring the dirty little brown caterpillar-like grubs, or cutworms, will eat through stems of young lettuce plants and other seedlings just below the soil surface. One day they look fine - the next they wilt and collapse. You probably won't know you've got them until this happens, and there's sadly nothing you can do to repair the damage! You can find a few in spring by forking over and picking them out - but birds are much more efficient at finding them. If you have a couple of hens or bantams and have a small movable coop - then let them onto your raised beds or put the coop and run onto your raised beds and let them at it. They'll scratch them up like crazy and have a whale of a time! If you don't have hens - then scratch the surface over for a few days before planting in early spring - and let all the wild birds find any pests. They'll be so hungry and very grateful in late winter/early spring. As I mentioned earlier - I always have to put nets on all my green leafy crops now - to keep the pigeons off - and they'll be starting to get interested in them as the weather turns colder and growth everywhere else slows up! I have enough clover to keep them happy all summer here - that's what they really love - and they never bother with most of the crops apart from lettuce or peas until the winter. All my 'lawns' are practically pure clover here now, as we've never used artificial nitrogen on them, or anything else come to that. Artificial nitrogen discourages clover and soil microbes. I also need to cover beds with nets in case the hens escape. 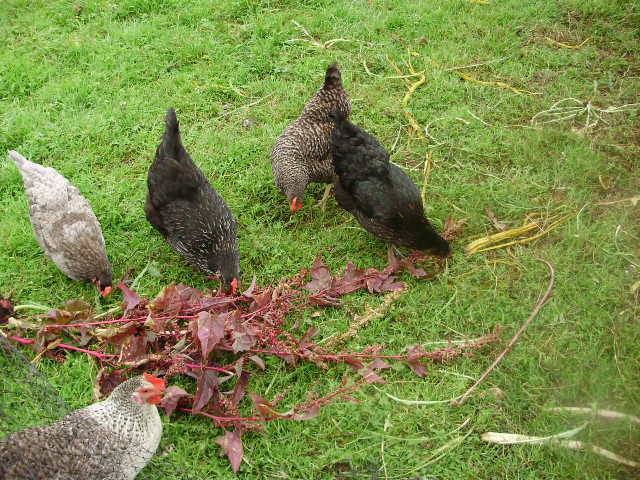 Hens and ducks can destroy a bed of lettuce or cabbage faster than you can say "cluck" or "quack" - leafy greens are their favourite food. Mine are always trained to come to call if I have an armful of green stuff - very useful if they get out by mistake - it's always a race to see which one of them can get at them first! There's a Permanent Hen Party in my Garden! Talking of hens - I think they really an integral part of any organic garden - they certainly are in mine. They clear up pests, scarify the moss and thatch from the grass, eat a lot of kitchen and garden waste and their droppings are a very valuable activator in the compost heaps! In addition to that they then produce the most fabulous orange-yolked organic eggs so much better than I could ever buy! Sadly organic poultry farmers have to keep a lot more hens on their ground than back garden poultry keepers like me do - otherwise it would not be economically viable to produce the eggs. I know this because I used to keep a couple of hundred organic laying hens commercially. Many people simply won't pay the true cost of egg production as they're so used to cheap food. As I'm always saying - cheap food comes at a price! And all too often - it's the animals that pay that price in terms of poorer welfare! Growing a lot of green food for them to eat in addition to their grazing, pays off not just in terms of a better colour and more nutrition in the eggs - but in terms of poultry health too. At this time of year I grow Sugar Loaf Chicory in my polytunnels to feed the hens and us! Large organic egg producers are getting very little more for their eggs than I was getting for mine over 30 years ago - when I was producing organic eggs commercially! Strange that people aren't prepared to pay a realistic price - when at the same time they want free-range and GMO-free eggs - with all the extra expense in organic feed which that entails. In addition to that, government rules mean that you have a dedicated packing house, and machines that can pack so many hundreds cases of eggs per hour! A massive investment and a bit daft when you perhaps only have a hundred or so hens! I don't believe that hens should ever be kept in large flocks. From my observations of hens over my lifetime - the more hens you have over 100 - the fewer will venture outside. So that rather defeats the object of free-range doesn't it? A really good orange-yolked organic egg is the most perfect of Nature's foods. They are absolutely the best meal in the world - and also one of the cheapest and most nutritious! I only keep a few hens to provide eggs for our own use now since I gave up keeping them commercially, and those have a lovely new house now. It's a re-purposed child's 'Wendy house' which my son lined with wire netting so that the fox can't eat through the wood and get in to kill any hens - as has sadly happened once in the past! I also designed a new system of runs that fan out from their house like the spokes of a wheel - so that they can be changed into another fresh run every couple of weeks while still being protected from hungry foxes! Rotating the runs keeps the ground healthy and also the hens. When I open their door in the mornings they leg it out as fast as possible so they're first to find any bugs - they look so funny with their soft 'tutu-like' feather trousers bouncing about as they run! Apart from all the lovely greens they get from the garden - I also feed them on a certified organic layers pellet which I get from my local farm shop White's Agri - which of course is GMO-free and antibiotic-free, as all organic animal feeds have to be under EU law. Organic layers rations are more expensive - but that's because they are the only ones which can be absolutely guaranteed not to contain GM soya or maize, or grain which has been grown with artificial fertilisers and sprayed with chemicals like Glyphosate. They must use all organic grain - and so naturally all the ingredients that make up the feed are more expensive. I wouldn't ever dream of using anything else though! They hens lay really well on those rations all through most of the winter and if you sell even just a dozen a week, or perhaps barter them for something else as I do now - then that more than pays for their feed - so your eggs after that are actually free! They also get any vegetables which are surplus from the kitchen but too good for the compost heap. Their favourite food in the entire world though is currently cucumbers and lettuce! They really pile into those - after all they're very sweet and we love them too. The system of seven permanent large runs in total now means they've always got lots of fresh grass to eat and new bugs to find. It's the only way I can keep poultry here. The greedy foxes are about keeping an eye out for any chance of a fast food takeaway all the time! Sadly I recently lost my last lot of hens to the fox which I'd had for three years - the fox found a chink in the fence netting that he could have been working away at over this summer while I had taken my eye off the ball a bit with the Tomato Festival etc, so I shall have to get some electric fencing to surround all the runs as a double insurance before I get any more hens. I shall get some more day-old chicks as soon as I'm less busy and have time to keep an eye on them. These will start laying in a few months and until they do I shalljust have to buy eggs which I hate - as they're never as good as our own! I've heard several more foxes very close by our back hedge in the last few days - so I could never risk their precious lives by just letting them wander around un-fenced. Frankly - just leaving hens to wander around, often because people can't be bothered to fence them in - or think it looks more romantic - is just hen abuse! In their lovely clean runs our girls always have shrubs and trees to shelter under from wind or rain, nice dry dusty spots to dust-bathe in which they love to do to keep their feathers in tip-top condition, and they have everything they would have in their natural habitat - which is originally South-East Asian jungle.There's more about keeping organic laying hens in the two podcast interviews I did with my From Tunnel to Table co-host Gerry Kelly on his Late Lunch show a couple of years ago - you'll find links to them in the contents panel. Well - as one book remarked on the month of October over 200 years ago - "The Gardener's year is a circle, for his labours are never at an end"..... But then another stated that - "There is more pleasure now in feeding on the fruits of your labour and industry, than in viewing the Ruines and Decays that this season hath made among Natures Glories" (la Quintinie - 1683) - A sentiment I heartily agree with!! A Personal Harvest Festival and 'Thank You' to all of you! This is the month for celebrating harvest festivals - and I have the end of another kind of year to mark in some way. The end of another year on the website - and a very different but just as satisfying harvest of emails to warm the heart, to personally give thanks for and to celebrate. So thank you to all of you who have sent them in the past. Sadly I don't have time to reply to a lot of mail these days, or I'd never do all the work in the garden and polytunnels, write my blog, and also write for The Irish Garden magazine, keep up to date on research, experiment with new ideas for healthy recipes to try out on my family and you - and also do my 'From Tunnel to Table' radio feature on LMFM radio with Gerry Kelly which is fun - but still work! You can still contact me very briefly on Twitter though - which takes a lot less time! When I first started this blog in 2010 on journalist Fionnuala Fallon's suggestion I barely knew how to use a computer - let alone what a blog was! I actually hadn't read any - and now I don't have time anyway! I could just about send an email in those days as long as I didn't press any of the wrong buttons! Hard to believe I know, to all you techies out there - but I've always been more into the practical side of growing plants and animals! It was a steep learning curve! I just wrote what I knew I would have wanted when I first started growing - and that was a few suggestions as to what to do in each part of the garden all year round and how to do it. The only problem with that is that it tied me to doing four blog posts every month! As I'm always experimenting and learning though - it's not hard to come up with new things to write about - although finding the time can often be difficult - especially when you have things like hurricanes happening! Anyway - thank you all for taking the time to read these ramblings from my garden. I've occasionally been told that I write too much! But as I've always replied - I don't believe in giving you only half the information - it's up to you how much you read! When I had only just started gardening and growing our own food - I was so grateful for checklists of things to do and how to do them. Articles I see these days - in magazines for instance - often leave out vital pieces of information necessary for success, or in some cases are even totally incorrect! Some of the information on blogs which people may have asked me to read, often seem to have been written using other people's articles, or from books - and not from direct personal experience - which I have always believed is the most valuable for other people. It's said that imitation is the best form of flattery though - and it's nice when kind people mention me. Thank you to those people for their generosity and good manners.